This weekend on the 5th episode of Kamen Rider Build, Blood Stark continues to pester Kamen Rider Build, secrets will be revealed and Sento will meet a man who knows about his past! "Sento ask Souichi why and were did he get the Pandora's Box panel that is hidden in the cafe's basement wall. Souichi tells Sento a secret about the panel that will shock him. Meanwhile, Sawa Takigawa gives Sento a very important information: she finally found someone who knows about Sento's past! And according to this man, Sento's real name is Taro Sato and that this man is a part of a band that he leads!" 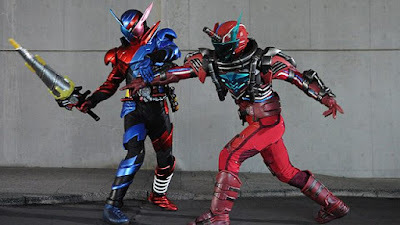 This weekend's episode will feature the debut of Sento's 5th best match form, Kamen Rider Build NinninComic form!